Fabrizio sent me his own “solo” album, Spirit of Mercy, which I absolutely loved. He’s got insanely good guests on his album like Flaco Jimenez, Eric Bibb, Charlie Musselwhite, Garth Hudson, and The Blind Boys of Alabama. There’s a lot of killer harmonica, but Fabrizio also sings on this. It’s pretty unusual to hear the blues sung with an Italian accent, but he understands the blues so well that he actually manages to sound better than most blues singers I know. It’s a totally fun album that I’ve listened to quite a lot. 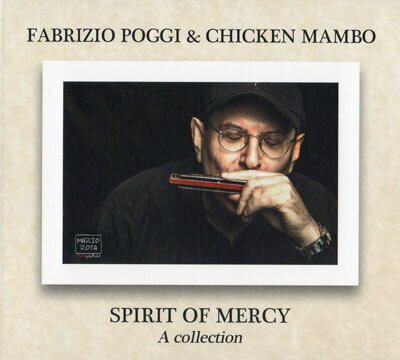 Italian singer and harmonica player Fabrizio Poggi has decided to record a collection of fourteen songs gathered under the title of “The Spirit of Mercy”. On one hand this work includes several traditional blues cuts and, on the other hand, you will also find some spiritual songs, always placing Jesus as the principal subject, to show his relationship with the soul and the spirituality of human beings. With this message Fabrizio aims to meet him again with Lord whom he had given up for a long time and show him his everlasting gratitude. This is a healthy, relaxing, poetical album, where the inspiration of this man is given to the audience by the whole music and words. Besides this harmonica player, singer, musicologist, writer and journalist called Fabrizio Poggi, you will also find in the album a number of first class musicians like The Blind Boys of Alabama, Flaco Jiménez, Garth Hudson, Charlie Musselwhite, Augie Meyers, John Hammond, Eric Bibb or Guy Davis among others. They all have done an album that simply becomes a pure delight for your senses. GREAT.